Project Mugello. Named for the famous card stunt Ducatisti preform in the Mugello grandstands near Florence, it took a city of Ducatisti to make it happen, 26 Ducati owners clubs in all. First order of business, we needed a grandstand! Then sell 1000 seats, literally a year of work and phone calls. In the end it was all about a couple minutes of pure luck. Literally a card stunt in a hurricane, pulled off in driving rain and 45 mph winds, the remenants of Hurricane Ike. When the time came to raise the cards the wind suddenly died down, we got in our 60 second show and back the winds came with a vengence, proving what WE knew all along, EVERYBODY, even Mother Nature, loves Ducati's! Special thanks to Foremost Insurance who sponsored the grandstand and Joe Kivett of Jacob-Davis Productions whose expertise made the difference when things got tough, the Ducati grandstand team from Bologna, the Desmodromiclubs of Roma and Kansas City, the Hoosier Hooligans, Desmohio and DRILL (among MANY others) for the technical help and manpower needed to perform this miracle. :-) And Extra Special Thanks to Bill Carr at Ducati Indianapolis. Without his help the entire Project Mugello 5 days would have been impossible to organize. 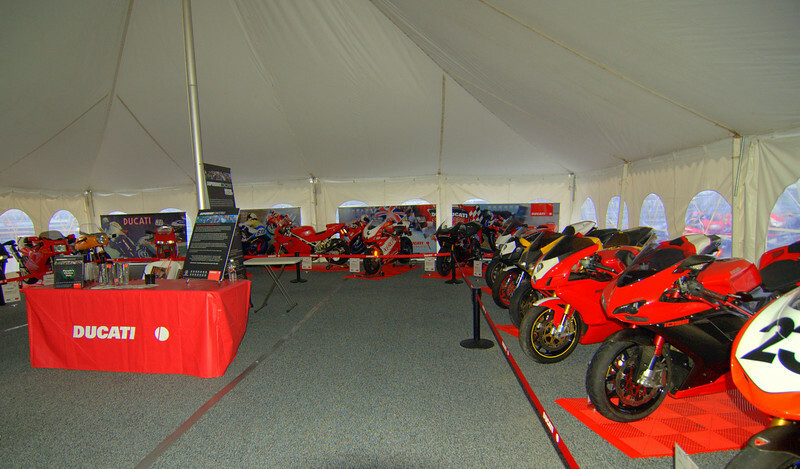 Time to open the Superbike Concorso tent and start the day!